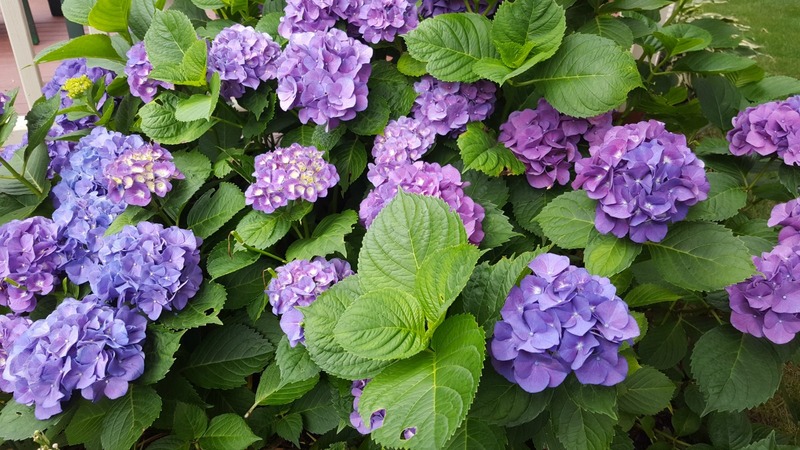 If you are lucky, you live in a place where hydrangeas grow in abundance. New England is one of those places. Summer in New England is a feast for the eyes with all of the hydrangea bushes in full bloom. Hydrangeas are one of my favorite flowers, so as soon as the blossoms start to open you'll find me cutting them to bring into the house. I have eight hydrangea bushes so there are plenty of blossoms to choose from. All but one of my hydrangea bushes are a gorgeous blue color. The other one is a deep, lovely purple that I love as well. Hydrangeas can be a challenge to arrange because they are so top heavy. 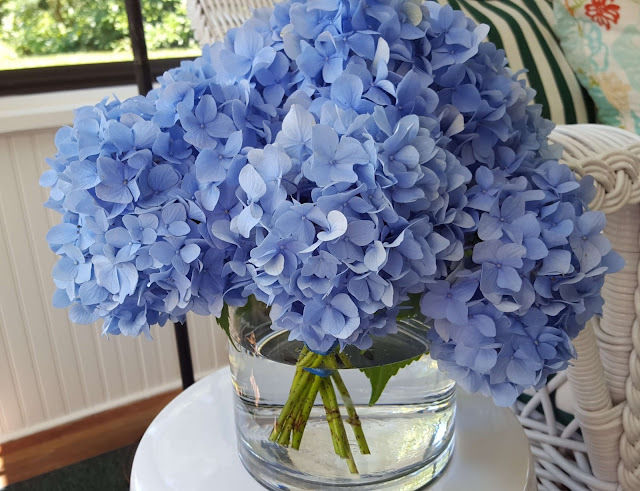 I like to use wide, short vases for my arrangements and I find that the hydrangea blossoms will often topple out of the vase. The same is true for lilacs and peonies that also grow in my yard. Keeping them corralled in the vase can be a challenge. Watch my two minute video for my tips for making a beautiful, full hydrangea arrangement that will last for at least a week in your home. 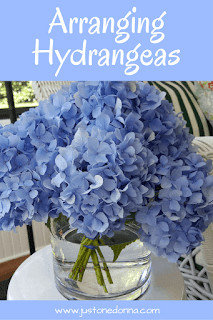 This is my simple tip for solving the problem of hydrangeas toppling from their vase. Use this tip for any blossoms with a sturdy stem and a top heavy blossom. You'll find this makes it easy to add fresh water to your arrangement as the days go by. It also makes cleanup quick and easy once you are ready to throw out your arrangement. Don't forget to subcribe to my YouTube Channel. It's another way to stay up to date with new recipes and home keeping tips.